Elegant console table with seemingly free-floating drawer. Design glass console FLY captivates with its completely straight form. 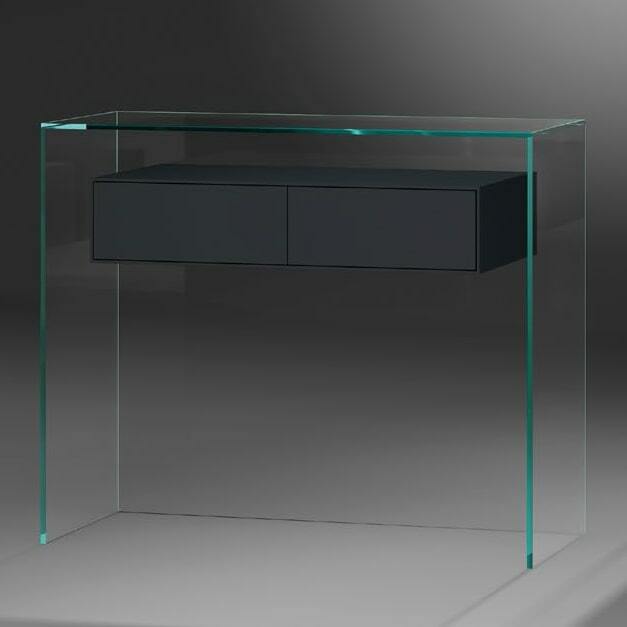 The specialty of this model consists of a seemingly floating drawer, which is almost invisibly attached to the clear glass back panel and can hardly be surpassed in optical lightness and elegance. Storage room and easy cleaning due to an optimal accessibility of all surfaces make this designer piece a dream come true. The Fly series is available in many different sizes and designs. Depending on the room’s colour scheme the drawer of this bedside table can be ordered not only in oak or walnut but also in lacquered MDF. Like all DREIECK DESIGN products this glass console is made in Germany. Do you have a question about "Fly 91"? How can we contact you?